The first wave of Warhol Dunny collectibles by Kidrobot. 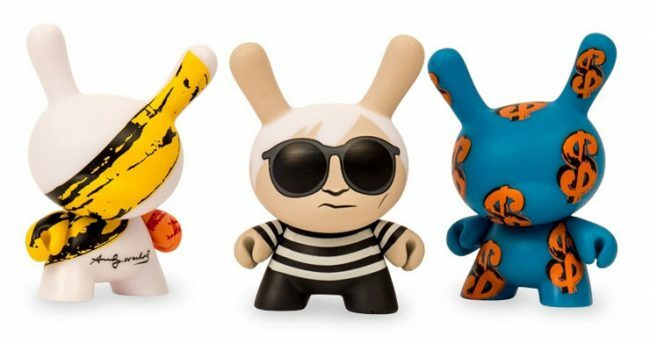 Kidrobot has teamed up with The Andy Warhol Foundation for the Visual Arts to create a limited edition collection of vinyl and plush inspired by the pop artist. Available this summer and fall, the collection features some of Warhol’s most iconic works (Campbell’s, Marilyn Monroe, Brillo, Velvet Undergound banana) plastered on Kidrobot vinyl (including the Dunny!) and plush pieces, ranging from blind-box collectibles to high-end art pieces. “We are delighted to collaborate with one of the most creative players in the art-toy industry to introduce an unexpected offering of unique Warhol collectibles,” said Michael Dayton Hermann, director of licensing, The Andy Warhol Foundation. The collection will debut at this summer’s San Diego Comic Con with the first wave in stores and online at Kidrobot.com this August.